Join us on a mystical and magical journey through Morocco and get a welcome dose of winter sunshine. During this retreat we will practice a specifically curated rejuvenating sequence of Kundalini Yoga & Meditation sessions under blue skies in truly unique places within the magical landscapes that morocco offers. Rejuvenate yourself from the cold of winter and visit places that are not of your average Moroccan holiday. The retreat includes 2 nights under the Milky Way to star gaze and deeply rest in a luxury in camp in the Sahara Desert with twice daily yoga/meditation/sound healing throughout the trip. •	1 night in Marrakech with time in the afternoon to explore or relax with a hamam, / spa, Turkish style. 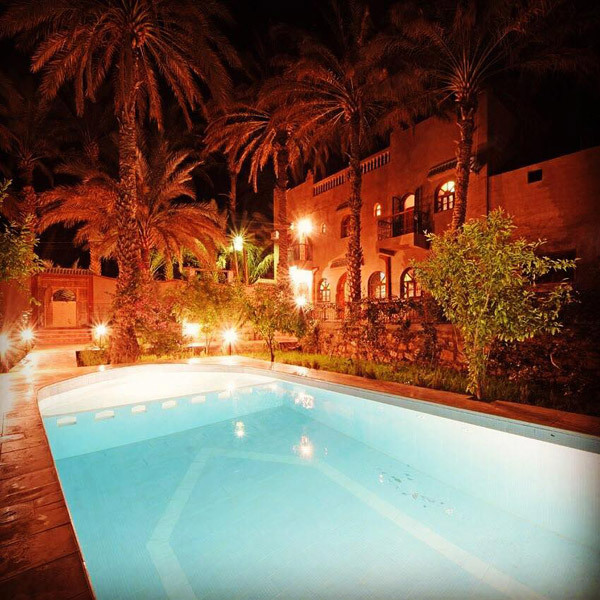 •	1 night in a beautiful mountain guesthouse in the Atlas Mountains. •	Journey along the old silk route through the Atlas Mountains visiting local artisans & farming co–operatives. •	1 night stay in the Palmerie of Skoura. •	1 night stay and to explore at UNESCO World Heritage Site Aït Benhaddou. 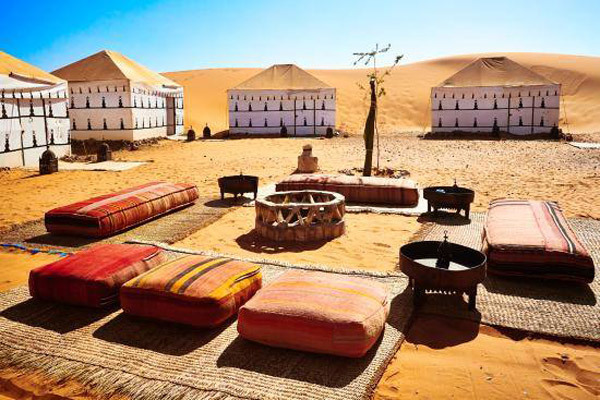 •	3 nights in a luxury camp deep within the heart of the Sahara desert. •	OPTIONAL camel journey deep in the Sahara to the camp. •	Evening campfires under the stars with Berber musicians to light the flame of the life within. •	Fun, laughter, connections and friendships formed. 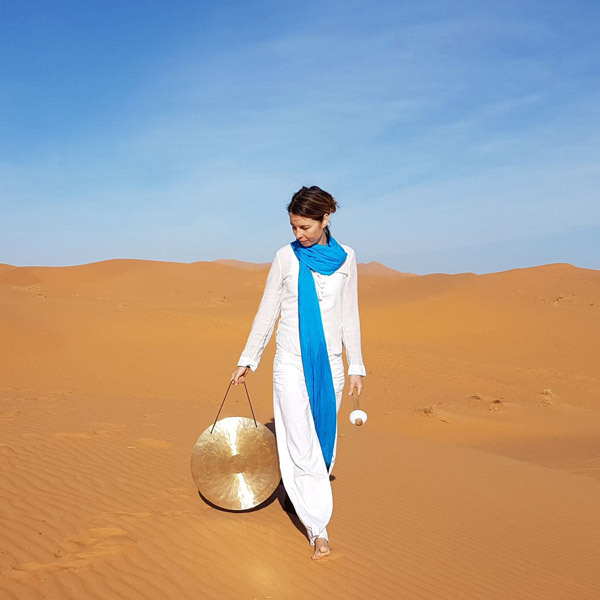 A nourishing and transformative sequence of yoga, mediation and sound healing sessions in unique and idyllic settings in ancient towns and villages, in the mountains, by lakes and in the dramatic, mystical and completely remote magnificent sand dunes of the Sahara dessert. On arrival we will gather in Marrakach once you have been greeted at the airport to have lunch if you arrive early or explore the city a while; time depending. From there our journey begins to the mountains where we will spend the night and have a celebratory dinner. As we continue our journey through the mountains we will pass by the Taourirt Kasbah and Atlas studios where several movies were shot such as Game of thrones and much more. We will then drive south towards Skoura where we will stay for a fantastic night in a Palmerie of Skoura. 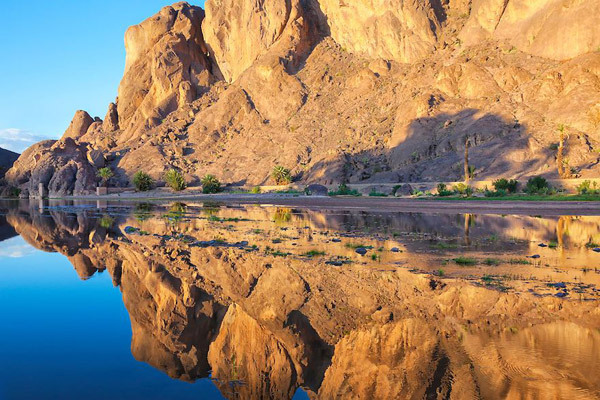 A chance to experience the calm and silence of the desert. 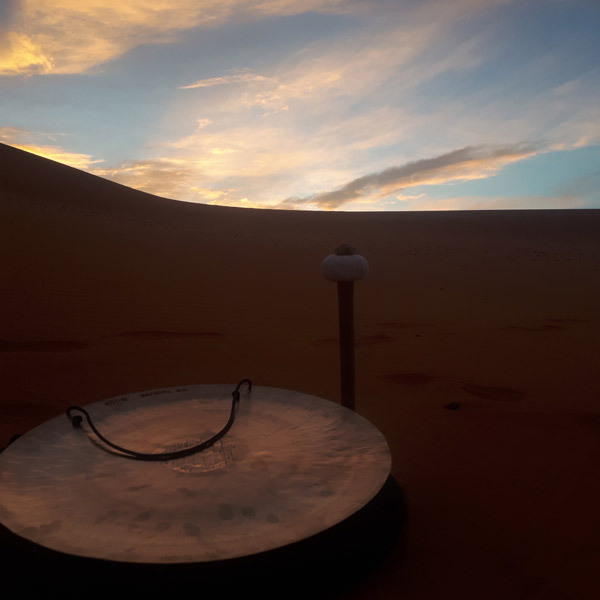 The Erg Chebbi sand dunes are the largest and most beautiful sand dunes in Morocco and provide a most dramatic backdrop for our yoga sessions and star gazing at the night sky. We will have both a morning and evening yoga sessions at sunrise and sunset with plenty of time in between to relax, explore, sand surf, have time to connect with one another or enjoy your own time however you wish. This fortified village in English or ksar, Arabic, is well placed along the former caravan route between the Sahara and Marrakech. The village is a striking example of the architecture of southern Morocco. This is not a place that is often available to book through the usual means, we are very lucky to be able to stay here, most people can only visit for the day. Arriving in the afternoon for our last night. 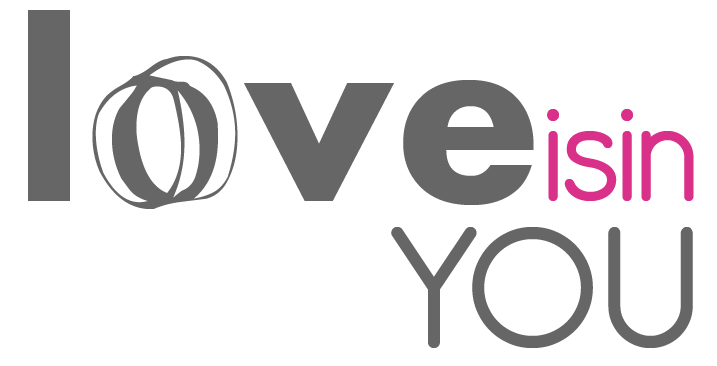 We can take a tour exploring this culturally rich city, the original market town where master craftsmen have been working their magic in the Medina (old city) for centuries. Evening camp fires – Visiting many nomadic villages and points of interest – Sand surfing in the Saharan dunes – Optional entering the desert camp by camel – Delicious food – PLENTY of sun, fun, friendliness and connection. As a yoga retreat is just that, a retreat, even though there will be some travelling between our carefully curated destinations the invitation is also that you deeply rest and be supported in that by myself, the team and the natural beauty and stillness that Morocco offers. Kundalini Yoga is a potent and dynamic practice fostering an experience of an expanded sense of self and vitality. The Kundalini as referred to in Kundalini Yoga is a potent tool for transformation, awakening an in dwelling life force energy that is within each and every one. Located at the base of the spine it is often conceptualized as a coiled serpent, which, when aroused can transform us, allowing us to access more of our full potential as human beings; physically, mentally, emotionally and spiritually. Morning sessions will focus on dynamic practice and transformation, working with the body in specific and healing ways using a powerful combination of posture, pranayama (breath), music, mantra and meditation to bring into balance the hormonal system, mood and emotions. Strengthen the entire body and nervous system. Create inner vitality. Cultivate the ability to completely relax. All of which foster expanded states of consciousness, awareness and healing. Evening sessions will focus on rejuvenation and relaxation, using meditation, yoga nidra and gong baths. Guided meditation practices with the rejuvenating practice of Yoga Nidra enable a state of deepest relaxation and conscious awareness to be realised, supporting the body and mind to fully reboot, recharge. You are the powerful creator of your life! Plug into the vibrancy of this beautiful land and discover and unleash that unique power and creativity which lies within.